Additional Garage and lot parking available. Located 1 block north of Elmhurst stop - Metra Union Pacific West line. We do simple food the hard way, by hand-making almost everything. For us, eating well also means doing right by the local economy through sourcing most of our ingredients from close to home. 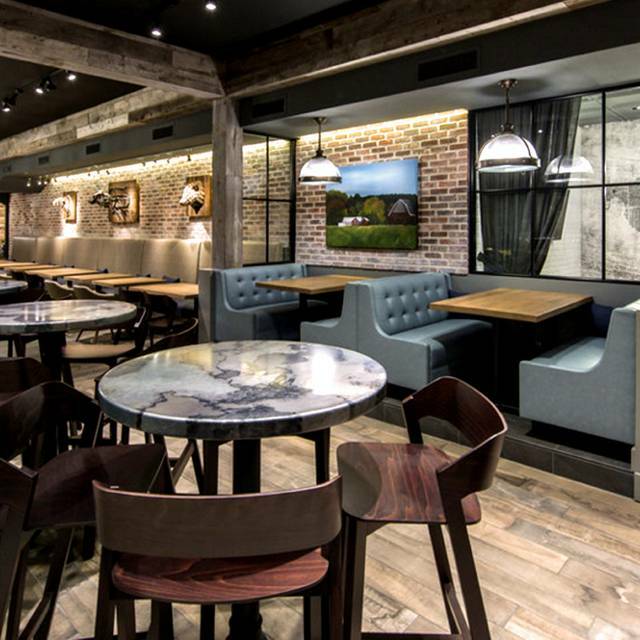 Our Chef honors and expands Midwestern food traditions through his kitchen at One Fifty One Kitchen | Bar, with a seasonal approach to menu creation. 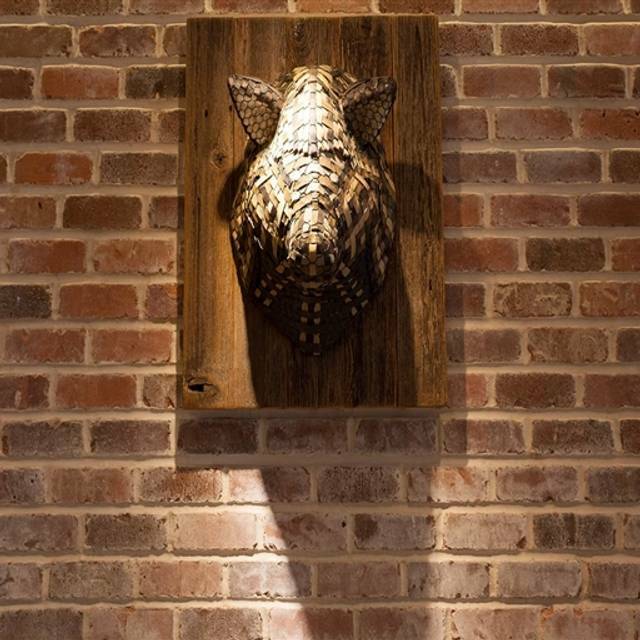 The menu is anchored by our chef's unique takes on rustic dishes, and is complimented by an extensive craft beer list, handmade cocktails, and a curated wine program highlighting a select group of our country’s best vintners. Our service strives to be timely and graceful, allowing our customers to focus on what is important to them: enjoying great company over a fantastic meal. We look forward to welcoming you in at One-Fifty-One. 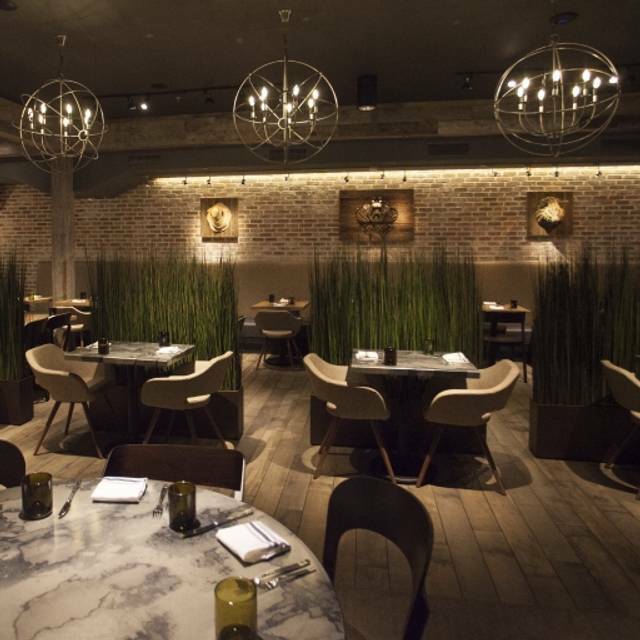 We hope that you will find our space to be convivial and comfortable – because eating is a celebration to be shared! In order to have a gluten-free hamburger we asked for 2 pieces of lettuce instead of the brioche bun. We were had a $2 up charge for 2 pieces of lettuce. Everyone knows that a brioche bun is more expensive than two pieces of lettuce. This was my third time dinning at 151, but sadly a bit disappointing. My first experience was for lunch, where I fell in love with the mussels. Such amazing flavors and that herb focaccia! The second was for brunch, and again.. loved everything we ordered. This last experience fell short in comparison due strictly to food. For starters we ordered the "taco Tuesday' nachos, baked goat cheese and mussels. The nachos ended up being more of a greasy ball of chips, and the mussels I loved so much on my first visit, were totally flavorless. Moving on to the main dishes, the 151 burger and butternut squash risotto. The burger was fine, but once again, the risotto had no flavor and needed salt to get any sense of taste. This was a birthday dinner, so having 3 of the 5 dishes leaving us wishing we had tried other things... was disappointing to say the least. I would definitely give it another go, but maybe just stick to brunch. Easter brunch-food was dry or over cooked. Kids under 5 should be discounted or free like many other places since they don’t eat much. Great food and service! Was very loud however. 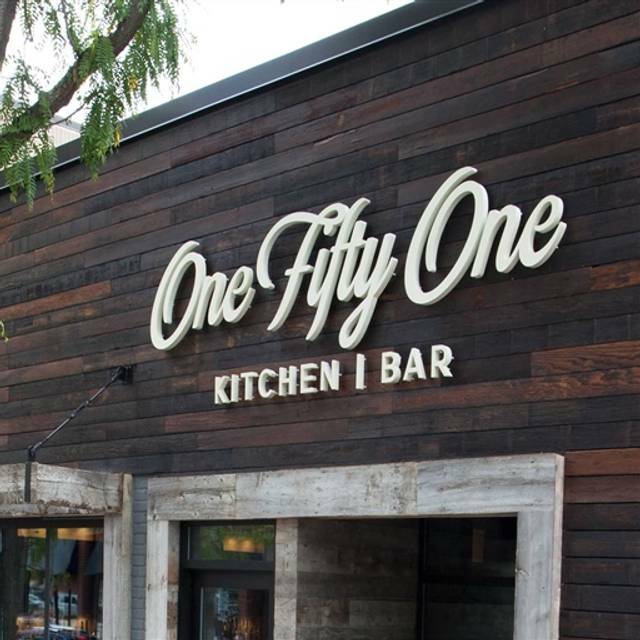 One Fifty One is such a fun and delicious place! I am literally counting down until the next time I can go! The decor is a modern meets farmhouse look, with gorgeous wood everywhere, and floor to ceiling windows in the front. The staff is amazing and the food is so good! We had the Crab cakes, Crab mac and cheese, and the grilled chicken club (add their cheddar cheese sauce, you won't be disappointed!). Save room for dessert, they are incredible too! They have great daily specials and some great events coming up! Looking forward to visiting again! Did not know what to expect...and was pleasantly surprised at a menu with good variety, great taste, and a new age, casual atmosphere. Dinner was good. We had to move tables because of a wobbling table, which was good because we were next to a table of 16 of really noisy guests.They offered a table closer to the large group, and we had to suggest a table further away. This should be an automatic step a restaurant should take when there is a large group and there are further tables available. Good good. Veronica, our server, was enthusiastic and helpful. I was visiting my niece who just moved to this quaint town of Elmhurst. I found the restaurant since they are new to the town. We all really enjoyed it. I especially love the ambience. Casual but upscale. Nice atmosphere delicious food and excellent beer list. Excellent food for a neighborhood restaurant. Coffee machine has been broken for a couple of weeks. Good selection of beer/wine. Loved the look of the place but unfortunately, it wasn't very busy which meant service was lacking - a lot of people talking amongst themselves forgetting drinks or refills, not checking back, etc. However, I know it would have been a different story if it was a busy crowd forcing everyone to actually have to work - so 100% would I recommend this place - just hope they fix the basics by then. The service was horrible which made me so disappointed as I live bringing friends here for the great food and ambience. We waited over 15 minutes to have a server even come and say Hi and fill our water/take drink orders. Then we waited another 20 minutes before they took entree orders. Seemed to be very understaffed and servers didn’t know who had what table. Food was terrible. I will never return! Great food and fun atmosphere, but it was VERY loud which made it hard to have a conversation across the table. We arranged to meet our friends at the restaurant. There were only 3 other parties there at the peak of Friday lunch hour. We had 2 waiters and waited an exceptionally long time for our food. The tomato soup was outstanding. But the burger had an unusual taste bordering on rancid. Maybe it was the melted cheddar cheese. They should reconsider their choice of cheese. The apple cobbler was also very good but after only eating a few bites of my lunch I left the restaurant feeling disappointed. This was our second visit to One Fifty One. The first was so great, we wanted to go back. The brussel sprouts appetizer was a half-price special, so we tried it. The flavor was quite good; the sprouts were a tad under cooked (too hard). I had the shrimp and grits which was outstanding! The grits alone were bland, but if you get a bite of the blackened shrimp with it....yum!!! My boyfriend had the crabby mac 'n cheese. It looked delicious, with the bread crumbs perfectly browned on top. However, the pasta was quite dry. The crab is shredded (which the server did explain) and not very noticeable. We will definitely go back again, but will not order the mac 'n cheese. Food was great, good ambiance. Only thing was the donuts were supposed to come with creme anglaise and they did not. I would definitely go again, and would recommend. Hey Mary. Sorry you didn't receive the Creme Anglaise. Definitely will talk to the staff, thanks for letting us know and for the review! Lenny was amazing. We would only come back if he is there. Our waitress gave us a check for 155 dollars then ran my credit card for 197 (she added drinks that we may have had)- but when dropping off bill Did not alert us that our 155 dollar tab that everyone gave me cash for was changed to 197. That is frustrating! She never came back afterwards to make sure we had no questions. Again - Lenny was great !!!!!!! Sorry about the confusion. I'm glad Lenny was able to provide you with exceptional service. We will touch base on your feedback! See you soon! Really high quality food. A bit pricey but worth it on occasion. We arrived and decided to sit at the bar for dinner. Our appetizers came out ice cold, the bartender was nice apologized and said that it actually was an extra meatballs from the kitchen and she didn’t know why we got it. Our second appetizer was cold as well. Unfortunately my entree actually had a piece of paper in it that was pretty large, and don’t really understand where it would have come from, but I started to eat it until I realized what it was. I will say the old fashions are delicious and the blue cheese olive they put in the martini was wonderful. Overall not impressed. In fairness, don’t think they were staffed up for the special event of Restaurant Week. We waited 20 minutes just to get our drinks (wine, not cocktails) and another hour for the food once ordered, which isn’t our normal experience there. We didn’t receive apologies or explanation, no acknowledgement from wait staff. Ordered medium well steak that came rare, had to finally track down the hostess to send it back because waitress was no where to be found, sent it back to have another returned, while quickly by someone other than our waitress , medium at best and the staff person didn’t wait to ensure that this time it was done to liking, in fact our waitress didn’t come to table and ask if it was better at all. We had to eat around the red portions. Our waitress was absent for most of experience, most likely due to being understaffed for the night. To top it off, the hostess didn’t check us in on our open table reservation, though she confirmed it verbally with us, which prompted a message from Open table reminding me of cancellation policy. This was not our normal dining experience there, which is usually very good, though it does normally take awhile to get drinks. The food was absolutely delicious! The staff was great. The atmosphere was awesome. Will definitely be back! time of our visit which lasted over 2 hours. Finally asked for coffee to be refreshed and no one responded. 2nd request finally resulted in some hot coffee. Overall, the place is very relaxing and food is delicious. Walking in the place looked cute and charming. We got our table right away. That was the quickest part of our visit. Our waitress was nice but the service was less than impressive. The restaurant wasn't busy, so I am not sure what the delay was besides lack of urgency. Our waitress dropped off the check, never returned to pick it up. We had to hand to a different waitress to handle. Overall, not very impressed. Great service! Knowledgable friendly server, great food and drinks, a little pricey, but fits in well with the neighborhood . This was our second time at One Fifty On Kitchen. Our guests for an 81st birthday celebration for my Father loved the food, the drinks the service and ambiance. We will return again soon. V-Day with my wife. Great downtown Elmhurst experience. Food and staff was wonderful. The restaurant itself is beautiful. We went for lunch and at 1130 when they opened there was nobody there. The appetizers were electric but we tried the corn and peppers one and it was a little different. My husband had the fried chicken sandwich and I had the shrimp sandwich and neither were great sadly. The fries were good though. But overall our experience wasn’t great and we wouldn’t go back because of the food especially when there are so many other food options in the area. From the time we walked in throughout dinner, everyone was attentive! Our waitress was outstanding! Our food was great. However, one in our group had to return her steak salad because the beef was too rare; that request was handled quickly and professionally. This was our first trip One Fifty One, but surely not our last! First time at the restaurant, went to a movie across the street. Food was very good, service was excellent and very nice atmosphere. Would recommend to my friends. Brunch was delicious! Our server, Megan, was great! Great food and ambience. I would definitely recommend. The scallops are incredible. The best I’ve had in a while. The waitress wasn’t overly friendly but she did her job. My only disappointment is that I indicated that we were celebrating a birthday (my son’s) via Opentable but the restaurant didn’t acknowledge it. Hence, we are having a do-over dinner celebration tonight. Food was great, service was just ok. They should make the ambience a little more welcoming. Attentive servers had good familiarity with the large menu and were able to make informed suggestions. Great cocktails and Thursday bottle special. Entrees at a number of different price points to fit into any budget. Shrimp and grits were excellent, beef stroganoff less traditional and less flavorful than expected. Scallion pancake appetizer was heavy on mushroom, rather light on scallion. Would absolutely come here again for just about any occasion! We had brunch for 9 people - food was great and the service impeccable!